We’ve had some nice autumn weather, but things are about to get a bit colder. Hopefully the rain won't get this bad. TEMPERATURES ARE SET to take a bit of a dive this week as colder weather begins to be ushered in. 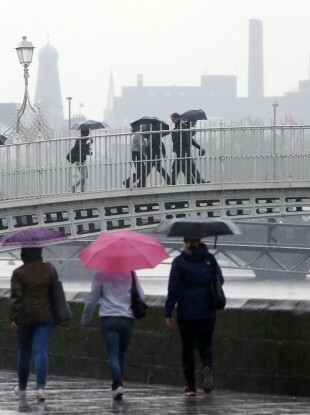 According to Met Éireann, tonight temperatures will reach as low as one to six degrees, with a touch of frost in places. There will also be clear spells and some scattered showers. The low temperatures will continue over the weekend. Tomorrow will be showery, cool and blustery, with a risk of hail or thunder in the northwest and north. Top temperatures will be eight to 11 degrees. There will be further frosts over the coming days, with some wintry showers. On Friday night, the lowest temperatures will dip to one to five degrees, and it will be coldest in the east. Expect rain and hail showers over the north and northwest this weekend, with some wintry flurries of snow perhaps hitting higher ground. While Monday will be drier with good sunshine, it will have a frosty start with the risk of ice. In short, wrap up warm – and bring that umbrella everywhere. Email “Frost, showers and low temperatures - the weather's set to get colder ”. Feedback on “Frost, showers and low temperatures - the weather's set to get colder ”.